In a bizarre scenario, three-time Major winning Jordan Spieth is staring at a five-figure PGA Tour fine should the final round of the BMW Championship be washed-out in suburban Philadelphia. And to make matters worst for the Texan he could still be fined if the event goes it’s full 72-hole distance. Any thought of a start to Sunday’s final round in the $US 9m event was dampened at 2pm local time with steady rain still falling on the host Arnomink course. Rain had been falling in the Philadelphia region since early Thursday evening and with heavy rain delaying the start to the new NFL season in Philadelphia’s match against the visiting Atlanta Falcons. It rained again heavily on Saturday night and with no start on Sunday to the last day of the penultimate event of the FedEx Cup Play-Off series. Weather-permitting, the Tour will attempt to start the final round at 7am Monday local time with a two-tee start and the 69 remaining players to be grouped in three balls. “It’s like we are kind of having to shovel sand against the tide, unfortunately, and that’s the sad part,” said Tour official, Carlton ‘Slugger’ White. England’s Justin Rose enjoys a one-shot lead at 17-under par and should he succeed in capturing what would be a third Tour title in Philadelphia, he would also go to No. 1 in the world and whether or not if the event were reduced to 54-holes. USA Captain, Jim Furyk was set to make that announcement at 9am Monday US local time within a conference room at the Marriott West hotel but that has been cancelled and with Furyk to use social media to advise his pick soon after the end of the BMW Championship. With this in mind, this is the bizarre scenario staring at Spieth should no play take place at all on Monday. It would mean staring at the issue of not having played the minimum number of 25 events and with an expected start in the Tour Championship to be his 24th even while the Ryder Cup would be a 25th. 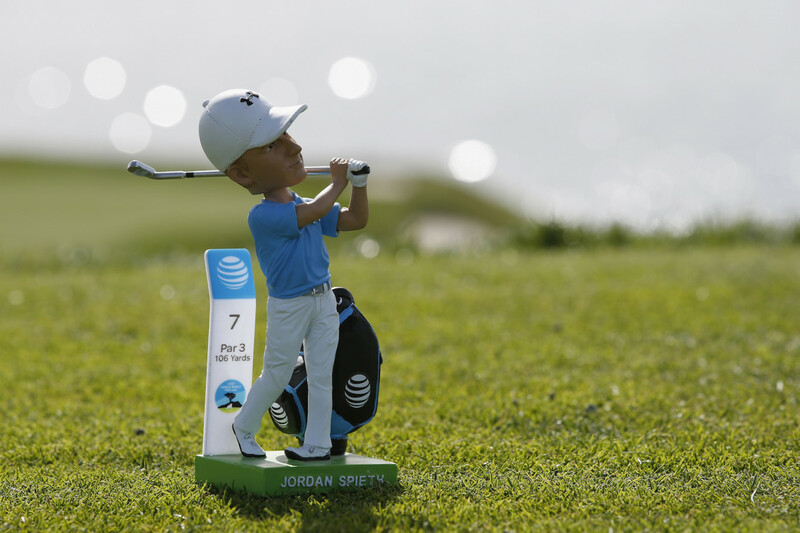 If Spieth does not qualify for Altanta he is staring at a fine. And if the play should get underway Monday and then be stopped due rain, the Tour indicated they would go into Tuesday to finish the championship but one thing is certain among so many uncertainties at present and that is the Tour will never start a delayed full round on a Tuesday. A Monday finish now has also ruine a number of other golfing activities for those competing in Philadelphia. Schauffele has a corporate outing he is hosting in Florida while Tony Finau will be back in Salt Lake City to host a ‘foundation’ outing while TaylorMade had a arranged a photo shoot get-together at a private course in New Jersey for their leading equipment players including World No. 1 Dustin Johnson along with Tiger Woods, Rory McIlroy and Rose.